Do you find yourself spending a lot of time figuring out when to say yes and when to say no, thinking about how to manage your time, reduce stress, do your best for your family, find a little time for yourself? 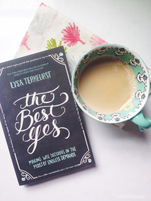 Lysa TerKeurst found herself in that same situation until she learned the power of “the best yes”, the choice that shapes all of our other choices. In this six-session study, Lysa uses her signature mix of transparency, Scripture-laced insight, and "been there" humor to suggest usable strategies for making wise decisions day by day. We would love to help you find the perfect study for your group.